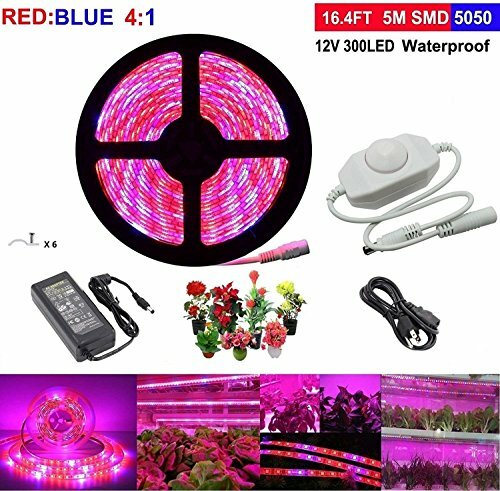 LED Grow Light,Topled Light® Plant Light Strip with Rotate Dimmer,Full Spectrum SMD 5050 Flexible Soft Red Blue 4:1 Rope Light for Home Greenhouse Hydroponic Pant Garden Flowers Veg Grow Light (5M) by Topled Light at Aquaponics In Paradise. MPN: 4322434568. Hurry! Limited time offer. Offer valid only while supplies last. Topled Light Flexible Strip Plant Light, ideal for hydroponic plants, succulent plants, pot plants, aquarium plants or other indoor plants. Topled Light Flexible Strip Plant Light, ideal for hydroponic plants, succulent plants, pot plants, aquarium plants or other indoor plants. all blue , all red in three forms , covering the wavelength range required for photosynthesis. -The visual effect , a combination of red and blue light pink color plant. -Red light promote plant production germination , flowering. -Blu-ray can enhance the chloroplasts of activities to promote plant photosynthesis. 【DIMMER DESIGN】: Come with Roate Dimmer, adjust the brightness anytime.Widely applicable to plant seeds with different growth requirements and prevent the power supply overload effectively. 【SAFETY】: LED grow light is made of flexible light bar. With IP65 waterproof design. can be installed in anywhere with any shape. Low power consumption, high luminous efficiency and long service life. Adhesive tape for secure and easy application, stable performance Led plant strip light. 【WARRANTY】: Plant light strip offers 12-months replacement and refund warranty with 24/7 technical support. If you have any questions about our products, please do not hesitate to contact us.